A section of the attendees at the opening of the Biennial Delegates Congress. 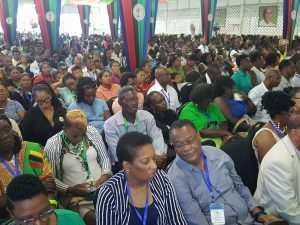 People’s National Congress Reform (PNCR) delegates at their biennial delegates congress were Saturday expected to consider a motion to ask government to pass a law to manage the public transportation system because of the “high risk” and “discrimination” facing commuters. If approved, the motion will mandate the PNCR to ask the coalition government to pass legislation before year-end and that a Transportation Authority be established to govern taxis, minibuses and other forms of public transportation in Guyana. Submitted by the PNCR’s Washington DC Group in the United States, they cited the need for a “centrally managed public transportation franchise system” that allocates licences to private operators of suitable transportation units that meet the standards of the governing authority. “The public transportation system in Guyana is in disarray and the safety and comfort of members of the travelling public is at risk and whereas owners of transportation units often practice discrimination in the provision of services to commuters,” states the motion that was submitted by the North American Group of that party. Bus commuters often complain of loud music, uncouth behaviour by drivers and conductors, the discharge of passengers in the middle of the road, use of unauthorised routes and speeding. Some bus operators do not accept children, the elderly and slow, disabled, blind and fat persons.